It is well known that Fred Gwynne had mixed feelings about the success of his character Herman Munster. It made it difficult for producers to see him as anything else, which is a shame! Therefore, when producers asked him to do a reunion movie he asked for an astronomical amount of money…and he got it. 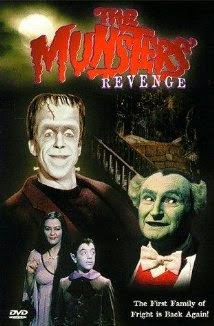 The Munster’s Revenge is a tepid substitute for the original series. Gone are Butch Patrick and Pat Priest, who played Eddie and Marilyn in the original series. I’m not sure how you can have a reunion without them! Bless K.C. Martel [The Amityville Horror, E.T.] for taking on the role of Eddie. They give him absolutely NO material to work with so it’s no surprise he pales in comparison to the original. The smart bet would have been to write a script that had the grown-up Eddie and Marilyn in it. It seems desperate to try and portray the rest of the cast as much younger than they actually were when they made this movie. I call this the Beverly Hills 90210 effect! Speaking of scripts, this one is a stinker. Absent are all the clever banter and bad jokes that made the original so endearing. There are time spans where nothing funny is being said or done. It just doesn’t work as a serious drama! Furthermore, the wax figures turned robots are absolutely ridiculous for 1981. [FYI wax does not move!] It’s obvious they are actors in suits who seem incapable of standing still when they’re supposed to. It’s thoroughly annoying. Ugh! The one bright spot in the movie is the scene where Fred Gywnne and Al Lewis (Herman and Grandpa) go undercover as waitresses. It’s the only moment in the film where I bust out loud laughing. Classic stuff. Another plus was the addition of Bob Hastings as Cousin Phantom of the Opera. He gives the role everything he’s got and even when the jokes run a bit thin he manages to pull off a great performance. What can I say? This one is definitely for the fans. The Munsters will always be one of my favorite shows but The Munster’s Revenge fails to capture the brilliance and energy of the original TV series.